Colorado Web Solutions has partnered with a variety of 3rd party Providers to offer services above and beyond the standard Yahoo! Store functionality. Our clients have access to the best prices and options from each of these companies. Yahoo! 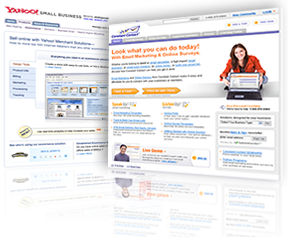 Merchant Solutions offers the incredibly popular Yahoo! Store platform. Hosting more of the top 500 Internet Retailers than any other ecommerce platform, Yahoo! is a one stop shop for a complete package of ecommerce tools and services. Constant Contact is one of the premier small business email marketing services available today. Email Marketing and Online Surveys from Constant Contact make it easy and extremely affordable to connect with your customers. Ask us about special Free Template offers. Go Data Feed offers Yahoo! Store owners an easy and automated way to create and submit product feeds from their Yahoo! Stores to all the major shopping and comparison portals. If you work with comparison engines, you will love this service! Capital Merchant Solutions and Colorado Web Solutions have teamed up to offer Yahoo! Store owners discounted Credit Card Processing (Merchant Accounts). Substantially discounted rates compared to the default Yahoo! Store partners. Nextopia and Colorado Web Solutions have teamed up to offer Yahoo! Store owners the ability to use a filtered navigational search (narrow down by specifications) directly integrated with their Yahoo! Store. Contact Us for Details and Demonstrations. Help secure your web site against hackers, earn shoppers' trust, and boost sales with McAfee SECURE trustmark service, used by over half of the Internet Retailer Top 500. Integrates seamlessly with Yahoo! Stores. The Advanced Shipping Manager will transform how shipping is calculated on your Yahoo! Store. If you are working with Drop Shipping, need real time rates for Fed-Ex and USPS, have special shipping needs or just want something that works better, we have your solution. Colorado Web Solutions and eWish have teamed up to offer Yahoo! Store owners the ability to easily integrate wish list technology into existing Yahoo! Store's. Complete management, registration and tools are included. Contact Us for Details. 15SEO.com offers Yahoo! Store owners highly detailed and easy to understand monthly SEO reports customized specifically to your domain as well as monthly search engine submissions for only $15 a month. 15SEO.com is the Yahoo! Store SEO secret weapon. eMerchant is another one of the Colorado Web Solutions preferred Merchant Account Providers for Yahoo! Stores. Using Colorado Web Solutions merchant account providers can save your store substantial amounts. Contact us for details. Wholesale Hub is a Wholesale Module for Yahoo! Stores. Wholesale Hub gives you the ability to control your pricing based on the customer or group. Never before has a Yahoo! Store's pricing been so easy to control. Fully customizable. Trusted by millions, Basecamp is the leading web-based project collaboration tool. Share files, meet deadlines, assign tasks, centralize feedback, make projects work. Our larger clients demand more advanced Analytic Solutions than Google Analytics. That's why we've partnered with Yahoo! Analytics to offer our clients one of the most robust custom analytics platforms available today. Aabaco Store Development and Aabaco Store Re-Designs are our specialties. We'll craft your Aabaco Store Templates so that using your Aabaco Store Design will be a breeze. Just in case though, we provide all of our clients with loads of training and Aabaco Store Tutorials.